Veronica Lucio, a music teacher at Gompers K-8 School, was honored by the City of Lakewood as a Hometown Hero for her dedication as a teacher. She received a certificate from Lakewood Mayor Steve Croft noting her impact in the community and beyond. 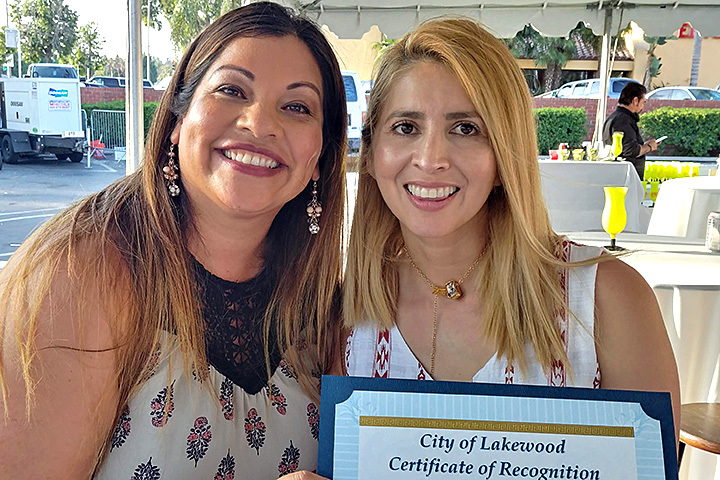 She accepted the award during the Lakewood Summer Fest at the Lakewood Mall, where she also was presented with a congratulatory certificate from the California State Legislature. College and Career Counselor Rachael Hamlet of the California Academy of Mathematics and Science recently was notified by the Yale Office of Undergraduate Admissions that she is a recipient of the 2018 Yale Educator Award. The award recognizes outstanding educators from around the world who support and inspire their students to perform at high levels and to achieve excellence. Students entering the Yale Class of 2022 were asked to nominate outstanding educators who have deeply impacted their lives. Hamlet was nominated for the award by Ikenna Maduno, who also was among seven CAMS graduates this year to earn admission to the Massachusetts Institute of Technology. HOMETOWN HERO – Gompers K-8 School music teacher Veronica Lucio, left, was honored as a Hometown Hero by the City of Lakewood. Joining her at the celebration is her friend Yurietta Luviano of LBUSD Textbook Services.